Walter Harrington Ryle III was born near Yates in Howard County, MO on June 1, 1896, and was raised in the Yates neighborhood, but across the county line in Randolph County. The eldest son of Walter H “Harry” and Kate (Stark) Ryle, he was educated in local rural schools then enrolled at the First District Normal School where he earned the 90-hour diploma and a state teaching certificate (1916). Ryle’s first professional position was high school principal, then superintendent of schools, in Clifton Hill, MO. He left there to serve a year of active duty in the US Army during World War I and after receiving his discharge, once again enrolled at the Normal to earn a BS in Education. He was a member of the first class to graduate after the Normal became Northeast Missouri State Teachers College in 1919. Ryle resumed his career in secondary school administration at Palmyra and Holden, MO, until he had completed his Master of Arts at George Peabody College for Teachers, Nashville (1927). He then joined the Social Science faculty at Northeast to teach history and geography. He was named Professor of Social Sciences in 1930 and a bit later took on added duties as Director of the Bureau of Placements. He continued these two positions until 1937, taking a sabbatical to return to Peabody for his PhD (1930). When President Eugene Fair died unexpectedly in 1937, the Board of Regents appointed Ryle his successor. He took office August 31 and for the next 30 years led the College through tremendous growth in enrollment and academic programs as well as additions to and beautification of the campus acreage and buildings. He retired and was awarded the title of President Emeritus on February 1, 1967. Ryle was active in the American Historical Association, the National Education Association, the American Association of School Administrators and numerous other professional organizations on the state and national levels. He contributed frequently to the Missouri Historical Review and other journals and was author of several books, including Missouri: Union or Secession (1931), The Geography of Missouri (1936), The Story of Missouri (1938), The Centennial History of the First Baptist Church of Kirksville (1968) and The Centennial History of Northeast Missouri State Teachers College (1972). He also took active roles in various organizations outside the academic community, including Missouri National Guard, the Masonic Order and Rotary International, but one of his first loves was the Boy Scouts of America. He became a Scout Master in 1917 and remained a leader at local and state levels for the rest of his life. The Great Rivers Council awarded him a bronze medal for “50 years of devoted leadership” in 1967. His academic honors included memberships in Kappa Delta Pi and Phi Delta Kappa, and an LLD from Kirksville College of Osteopathy and Surgery. 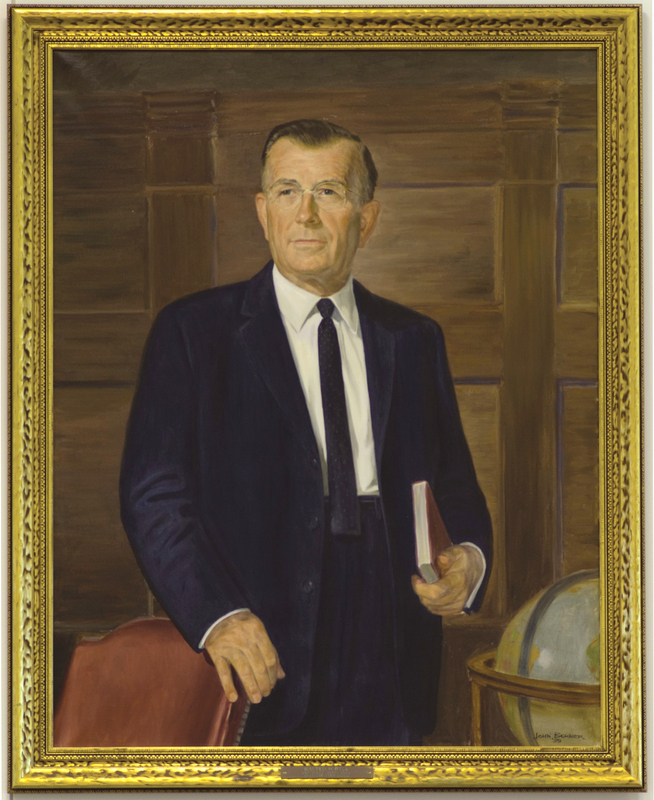 His permanent memorials on campus include Walter H Ryle Hall, a residence hall completed and named for him in 1962, and his portrait in the Presidents Gallery. Walter Ryle and Maurine Adell Lea married June 7, 1927 in Clifton Hill, MO. They had one son, Walter Harrington IV, a long-time member of the Northeast faculty. President Ryle suffered a heart attack and died October 30, 1978 in a Kirksville hospital. He was buried next to his wife at Maple Hills Cemetery. Please Note: This biographical sketch has been compiled from secondary sources and may not be complete or totally accurate; it is therefore subject to update or correction. Ryle, Walter H. Centennial History of the Northeast Missouri State Teachers College. Kirksville: the College, 1972. Selby, P.O. One Hundred Twenty-Three Biographies of Deceased Faculty Members. Kirksville: Northeast Missouri State Teachers College, 1962.